Release of 2018 PPM Data Quadrant highlights best enterprise software as selected by business and IT professionals. 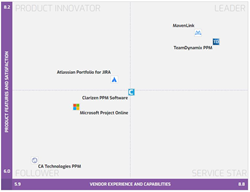 Software Reviews’ 2018 Project Portfolio Management (PPM) Data Quadrant Awards published today names Gold Medalists in the space: TeamDynamix, Mavenlink, Clarizen and Atlassian. Unlike traditional software awards, Data Quadrant Awards are based solely on user reviews and determined by a transparent proprietary methodology that is available in full in Software Reviews’ 2018 Project Portfolio Management (PPM) Software Report, also published today.